Little Flower Khadi & Village Industries Leprosy Rehabilitation Centre is right up on the border between India and Nepal in Raxaul, Bihar. Men and women hand spin silk yarn, dye it and then weave it into scarves and throws. They also weave cotton fabric for scarves and shirts and towels. The centre provides vital employment for people who would otherwise find it very difficult to find work because of their association with leprosy. Products Sarees, scarves, shirting, wall hangings, shawls. 4. Achievements/changes in the group in the year Applied for registration for KVIC approved institue. 6. Major learnings in the last year To become more independent by opening retail outlets. Fair Trade affiliations Provisional member of WFTO. 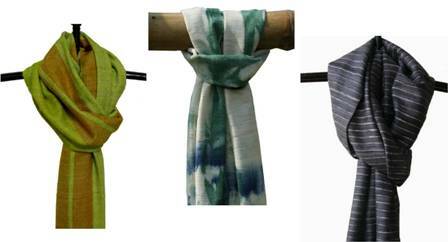 Here are just a sample of the hand spun silk scarves in plain colours, patterned and tie and dyed.